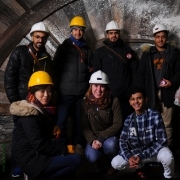 Our big challenge of this month’s Getaway Saturday was going 140 metres underground, professionally equipped with helmets and torches. However, our brave students managed really well in the dark! The 1-hour tour of a former coal mine was really informative and our students got a first-hand experience with a proper Yorkshire accent. Before we headed back to Leeds, we also had a quick stop at The Hepworth in Wakefield, a gallery which is itself an architectural highlight. This art gallery houses modern local and international pieces of art and is a great retreat from the hectic outside world.